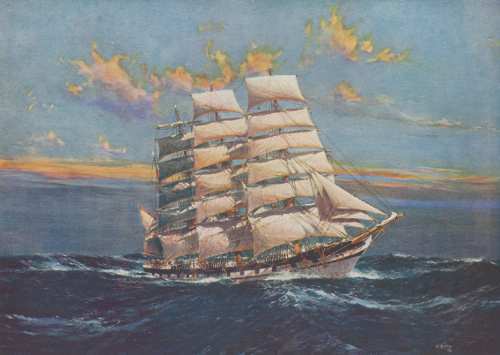 Two mutinies, a man presumably lost overboard, two women crew members and a wreck off the coast of Australia are just some of the colourful incidents in the life of this four-masted, iron-hulled barque which was painted in 1927 by marine artist Jack Spurling. The painting by Spurling, while spirited, gives little indication of the rather dramatic life of the ship itself, which started at Greenock on the river Clyde in Scotland in 1886, where she was built for the Falls Line of Glasgow by shipbuilders Russell and Company. The ship was just over 2000 gross tons and had a length of 83.87 metres, a beam of 12.64 metres and a draught of 7.23 metres. Her hull was of iron and her masts and rigging of steel instead of the more usual wooden spars and hemp ropes. Another innovation included in her design was the provision of “bridges” which allowed the sailors to move in relative safety even in rough weather when seas would regularly break over the decks. The Falls of Halladale was built to carry general cargo, a highly competitive and rather rough trade in those days. On that same trip a seaman, Charles Anderson, reported for duty when the ship sailed, but was somewhat inebriated and on the first watch call the next day was missing. It was presumed that he had during the night gone up to the forecastle and been washed overboard. In March 1899 the Falls of Halladale sailed from Tacoma in Washington State bound for Cape Town and the crew mutinied, claiming they had been “Shanghaied” but after about five hours the men went to work and the ship was under sail for South Africa. On route to South Africa more incidents occurred – first the mate was washed into the scuppers by a large wave and suffered a broken collar-bone and a dislocated shoulder; then four of the crew became ill. 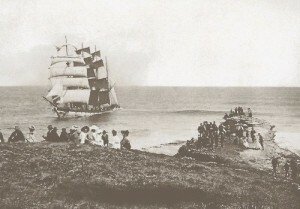 The ship sailed from Hamburg, Germany, in June 1900 with the two women in the crew. They were Capt Fordyce’s wife, who was 58 at the time, and her daughter Jeanie who was at the time in her 20s. They were signed on as “Purser” and “Assistant Purser” with wages of one shilling a month. They apparently spent much of the two years they were aboard the ship doing needlework! On 25 July 1903 the ship, now under the command of Captain D.W. Thomson, sailed from Liverpool with a cargo of pig iron, salt, soda and some general merchandise, according to the San Francisco Call of 14 March 1904. The ship ran into rough weather in September 1903 off the islands of Diego Ramirez south west of the notorious Cape Horn. The weather continued foul for three weeks and they struggled to round the Cape. At last in January 1904 they made land at Invercargil in New Zealand by which time the crew was becoming mutinous. Eight crew members, under the leadership of on Thomas Mooney, had to be put in irons and, after the ship had received fresh water and supplies from the shore, anchor was weighed and they set sail once more for San Francisco. People from the nearby town of Peterborough came out to see the wreck of the Falls of Halladale. Image via Wikipedia. Unfortunately for Capt Thomson an even more bitter experience was to befall him two years later. On 14 November 1908 Thomson, on a voyage from New York to Melbourne, Australia, estimated he was safely off the coast of Victoria but could not verify his position due to heavy fog. By the time the fog lifted he could see he was much too close inshore but it was too late to do anything about it and the ship ran onto the rocks under full sail. All 29 crew members were able to get ashore, but there was no hope of salvaging the cargo and the ship sat on the rocks with all sails still set, becoming a sight for the residents of near-by Peterborough. They would come out to picnic on the hills above the wreck, which has since been declared a historic wreck site. Capt Thomson was charged by a Court of Marine Inquiry in Melbourne which found him guilty of gross misconduct and imposed a small fine and suspended his master’s ticket for six months. A sad end indeed for a colourful ship. The painting is in oils on canvas laid on board and measures 86.4 cm. x 106.7 cm. “Jack Spurling was the pilot who sailed many a pretty clipper ship through memory straits and anchored her again before the eyes of those who knew her best and loved her most.” – from the Sydney Morning Herald of 30 September 1933: obituary of Jack Spurling written by “Redgum”. Born John Robert Charles Spurling on 12 December 1870 he preferred to be known simply as “Jack”. As a youngster he haunted the London’s East India Docks at Blackwall near his parent’s home where he sketched the ships he saw there. “Redgum” in the Obituary quoted above mentions an incident when the young Spurling, always “nosing” around the ships in the docks, was asked by the captain of the ship “Mermerus”, Captain Cole, what he was doing. Luckily the young Spurling did not take the captain’s advice and a few years later went to sea aboard the “Astoria” bound for the East. In Singapore Spurling fell from a yard arm and sustained injuries which necessitated a long stay in hospital and when he was discharged he joined the Devitt and Moore company, eventually gaining his second mate’s ticket. He then joined the Blue Anchor line as a second mate and did service in steamships in the colonial trade. After some seven years at sea Spurling left to join the theatre where he was kept busy in the musicals of impresario and theatre owner George Edwardes, who in turn worked with Richard D’Oyly Carte and the famous light opera composers Gilbert and Sullivan. Advertisement in “Blue Peter” for the Spurling prints. Annotations by my late father Murray McGregor who was passionate about ship recognition. 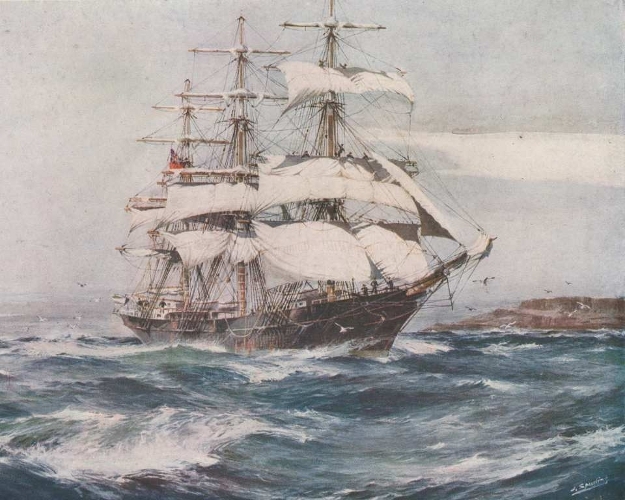 His paintings came to the attention of the editor of the shipping journal Blue Peter, Frederick Hook, who placed several in the magazine where they attracted a great deal of favourable reaction from readers. Hook then commissioned Spurling to contribute more paintings for the journal, which also proved extremely popular, so that the journal in the 1930s offered 77 of Spurling’s paintings as “artistically mounted, ready for framing” colour prints at two shillings each. The most famous and popular of the tall ships were the tea and wool clippers which Spurling painted with unparalleled skill. Indeed he was renowned for being exceedingly accurate in his depictions of the riggings of these ships. 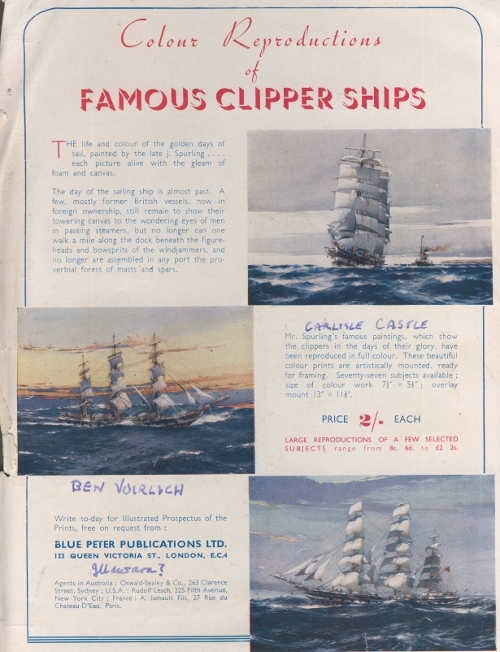 The editor of the Blue Peter offered a reward to anyone who could fault the rigging on one of Spurling’s paintings – the reward was never paid. 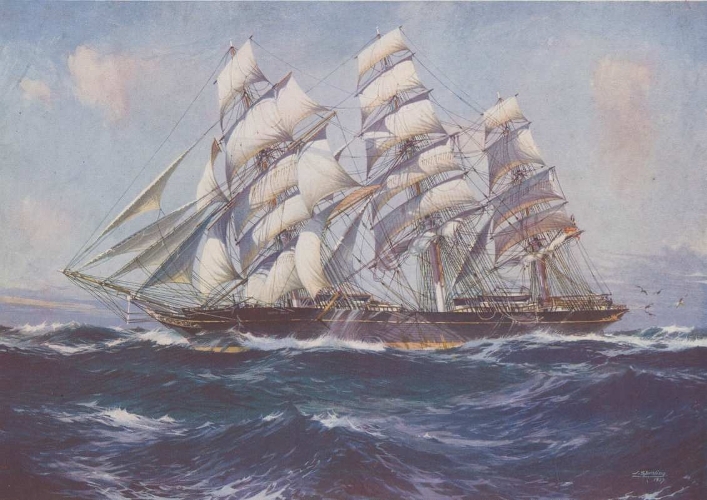 Two of the most famous ships painted by Spurling were the “Thermopylae” and the “Cutty Sark”. “Thermopylae” was built in Aberdeen, Scotland, and launched in 1868. She was built for the Aberdeen White Star Line and was designed to be very fast in order to get tea from China to London in as short a time as possible for her owner, George Thompson. Getting the tea from China to London quickly was good business and turned a tidy profit for the owners of tea clippers. 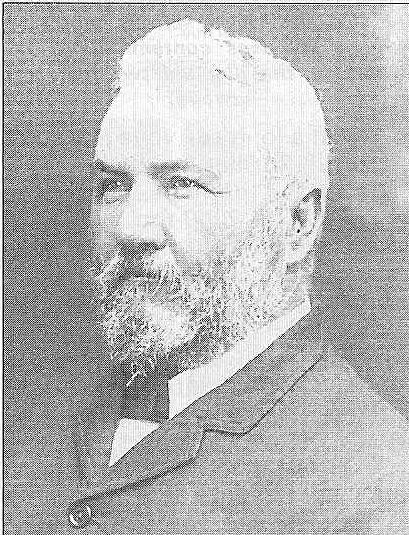 A rival of George Thompson was the former sea captain turned ship owner John “Jock” Willis who wanted a ship to beat the “Thermopylae”. He got marine architect Hercules Linton of Glasgow to design a ship to beat “Thermopylae”. This ship was to become one of the most famous sailing ships of all time and was launched in November 1869 and christened the “Cutty Sark”. Spurling’s 1924 painting of “Thermopylae”. 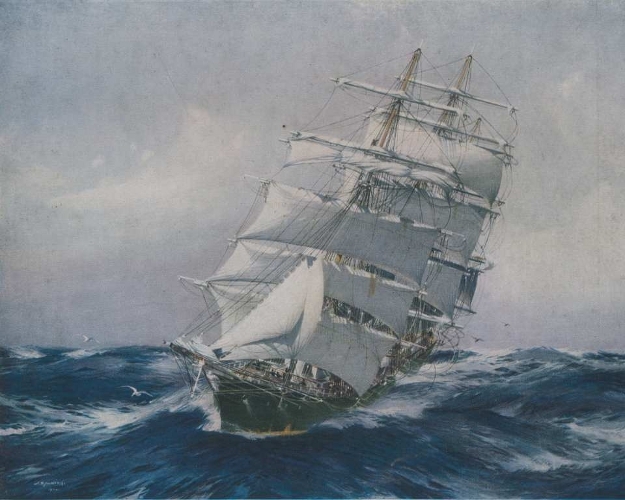 “The picture shows ‘Thermopylae’ sheeting home the fore lower topgallant sail in a strong breeze” (from the “Blue Peter” caption to this picture). Nannie chased Tam on his horse Maggie but only managed to pull Maggie’s tail off. The ship “Cutty Sark” was designed to pull the tail off the “Thermopylae”! These two famous ships were engaged in a famous race from Shanghai to London in 1872 – actually the only time they were to race each other. The “Thermopylae” got to London first as the “Cutty Sark” lost her rudder and had to go into Table Bay for repairs which took 13 days. However, she reached London just six days after “Thermopylae” and was declared the winner because of the speed which she had achieved – some 17.5 knots. Spurling, apart from the accuracy with which he painted the rigging of the tall ships, was also able to create a sense of drama in his paintings, especially in his treatment of the sea in various conditions. Apart from his treatment of the sea – which is always superb – his paintings usually have some intriguing details like the clothing of the sailors or a flock of seagulls whirling around the stern of a tall ship at full speed with all sails set. He certainly told many a “merry yarn” in his wonderfully evocative paintings of ships and the sea.